Cootie catchers, sometimes known as paper fortune tellers, have long been a favorite activity of elementary-and middle-schoolers, but folks of all ages can enjoy these origami paper crafts. Origami is the Japanese word for "paper-folding," though the art of paper-folding arose separately in Japan, China, and Europe at different times. Although you might remember how to fold a cootie catcher from a piece of lined notebook paper, it's also fun to find one that's been designed in a special theme. When you find the one you like, simply download, print, and fold the paper template, and then grab a friend to have a little nostalgic fun. 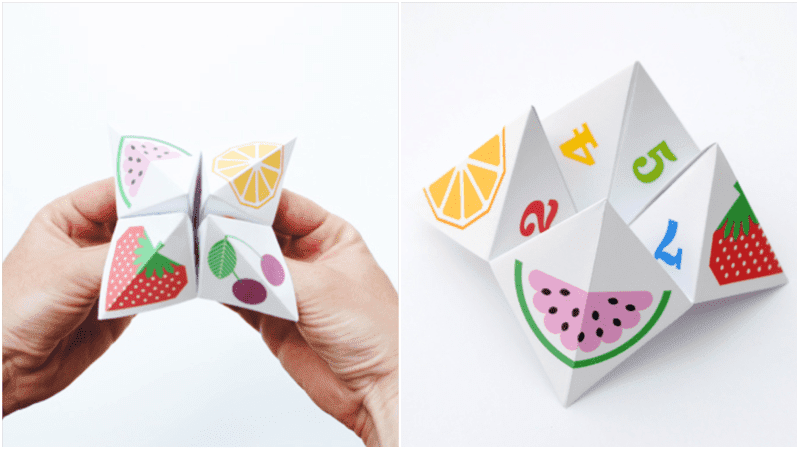 If you need to refresh your memory on how to make one of these origami fortune tellers, this easy-to-follow tutorial will have you caught up in no time. Those who love sea creatures will adore this printable cootie catcher in the theme of a shark fortune teller. The template is free to download and print at home. These shark cootie catchers double as puppets. If the kids want their own animals, there are other creatures to choose from, too, including tigers, peacocks, and unicorns. Not all cootie catchers tell your fortune. With this free printable cootie catcher from The Idea Room, kids will enjoy brain teasers and riddles that are on the inside, rather than the standard fortunes. Teach the kids the concept of "paying it forward" with a Kindness Cootie Catcher, a nice idea from Coffee Cups and Crayons. Instead of fortunes or riddles, the interior of the folded paper gives ideas for how to complete an act of kindness for another person. "Harry Potter" fans will love this Sorting Hat-themed cootie catcher printable. This fortune teller will decide which Hogwarts house you should belong to: Gryffindor, Hufflepuff, Ravenclaw, or Slytherin. This boredom buster cootie catcher is part of a pack of free activities for keeping kids busy and stimulated during holidays or at parties. The printable pack also includes quiet activities such as coloring sheets and craft activity sheets. Give your wedding guests a chance to get to know one another printable cootie catchers. Place these cootie catchers at the table for your guests to play with, and they will laugh and become quick friends by the end of the cocktail hour. Although this printable cootie catcher is blank on the inside, the outside design is a super-cute fruit print. Come up with your own messages or fortunes for parties (or just for fun). This printable cootie catcher has a lovely pattern that you can color in yourself, either with watercolor paints, pens, or pencils. After you're done coloring, write in messages and fold it up. Create your own customized cootie catcher with a blank printable. Once you have downloaded, printed, and folded the craft, you can write in fortunes, riddles, games, or your choice of message on the inside.